Simply spray onto soiled surface. Wipe off with a clean absorbent cloth, towel, micro fiber or damp sponge. There is no rinsing required, except for food contact surfaces. 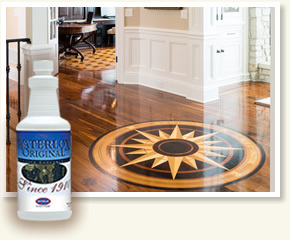 For surfaces other than Waterlox, we suggest testing a small area first. Dilute 1-2 ounces of concentrate per gallon of warm water. 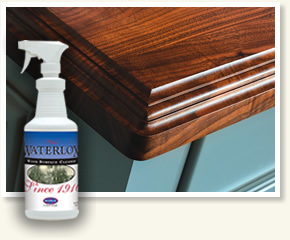 For heavy duty cleaning: Dilute 2-4 ounces of concentrate per gallon of warm water. Dip mop, sponge or washcloth into solution and wring out thoroughly. Clean in usual fashion re-soaking mop, sponge or washcloth and wringing regularly. There is no rinsing required, except for food contact surfaces.